I’m a recent convert to Apple; I purchased my first iPhone a couple of years ago, and it’s the longest I’ve ever owned any mobile phone – then I upgraded to the iPhone 4. Last year I gave a 21″ iMac as a gift to my in-laws, and a few months ago I bought myself an 11″ Macbook Air to use at work. On the other hand, I’d never so much as held an Android device for more than a few seconds, and know nothing about the platform. So even though Sony (X) gave me the opportunity to babysit a Sony Tablet S – an Android tablet computer – don’t expect me to gush about it. I did take fairly extensive notes while testing it, which is why I’ve decided to split this review up into two parts. So here goes: an honest review of an Android device by an Apple user. 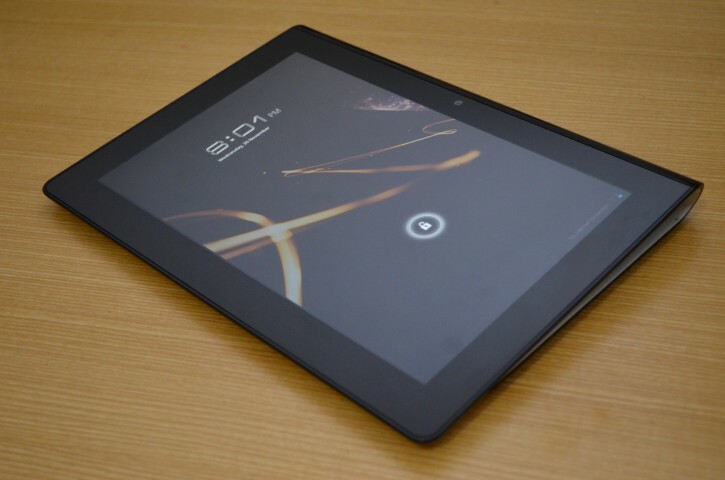 The unique selling proposition of the Tablet S is its “wave” design. Sony’s departure from your usual thin, sleek slate design is intended to mimic a book or magazine bent backwards, making it easier to hold than other tablet devices. I learnt about grips from this post on interaction design, so I can sound smart and say that when you hold the S you’re using a “Power grip” (using the palm of your hand for support), whereas with other devices you’re forced to use a “precision grip” (with only your fingertips). In this age of aluminium unibodies and carbon fibre this and that, a device at the price point of the Tablet S (starting at $579) shouldn’t feel quite so… plastic. Call me old school, but still feel that whenever I get a new tech gadget, it should feel like the future. The build quality of the S leaves much to be desired: most notably, the screen isn’t Gorilla Glass and the review unit I received came with scratches on the screen from a previous reviewer (scouts honour!) There are also some obvious seams, e.g. where the plastic “wave” back joins up with the screen there’s a noticeable (maybe 0.5mm) difference in height, into which all manner of gunk found its way – and considering how many people have handled the device before me, I shudder to think what it might consist of. In short, it feels like somebody glued a screen onto a crappy plastic housing. Luxury car makers are infamous for spending (wasting) time on details such as making sure that doors have a certain “weight” to them, and that they make an appropriately satisfying “thud” noise when you close them. This is what Apple is known for: the relentless pursuit of perfection in its products, tweaking every little imaginably trivial thing until it becomes just so (if you don’t believe me then check out this article about making see-through aluminium). What the Tablet S shows about Sony is that they can do good design, but have yet to grasp the concept that the proportion of refinement-to-design should be in the same ratio as that of the proverbial perspiration-to-inspiration.